African wildlife safari vacations in Southern Africa are one of the most rewarding and safe travel options available in our un-settled world. Ranger guided tailor-made African overland camping safaris are an affordable and exciting form of travel allowing passengers to customize their tour, to suit their budget, time and interests. The secret is in finding a professional Free-lance Ranger Guide (About a dozen only, in the whole of Africa). By cutting out the middleman and the travel agencies, you can save up to 40% on your African safari tour. The most important thing is to make sure that all the essential things associated with the safari are included in the quoted price: ground transportation, accommodation, meals, excursions, Ranger guide service and transfers. With 25 years experience and passion in doing Ranger guided African safaris. 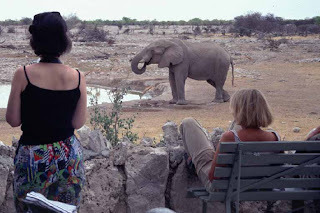 Gateway Africa Safaris would be one of the highly recommended places to look for advice. Let their Ranger guides help you plan your safari, you will be pleasantly surprised by their knowledge and professionalism. Wildlife safaris in Africa with your own personal Ranger guide is both intriguing and humbling, created by the beautiful balance between the wildlife, the landscapes and cultures, with-out compromising on that some-thing truelly unique.